In the late 30s I had a good summer job in a large store that sold fabric to upholsterers (on Broadway). There were three salesmen on the road everyday plus mail in orders, call in orders and some walk in trade. My job was mainly to pack going orders and prepare the paperwork for the Railway Express pick up truck. 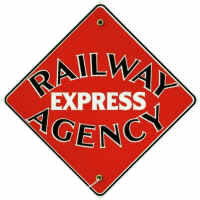 Railway Express has not been in business for many years. Their trucks were always easy to spot they were all painted green with red wheels and resembled the caboose on a set of old railroad cars. The job paid .50¢ per hour with one half time for overtime, no error, not time and one half for overtime. The employer was able to have this unusual arrangement because an employee was paid for time he was absent. I often wondered what would happen if an employee was out 2 days in a row. After lunch I walked across the street to the D. L. & W. railroad station which was an outdoor station and read the newspaper I had bought in the morning. D. L. & W. stood for Delaware, Lackawanna & Western. The common reference was Delay, Linger & Wait. There was a song about the railroad that was done in dialect and would no doubt be considered offensive to certain ethnic groups today. My total daily expense for working was .50¢ a day. I did now make enough to pay taxes and social security tax was one half of one percent. I worked most Saturday's till noon. After that I was free to spend a part of my pay. There were shirt shops and pants stores where the low end goods started at .90¢. The most expensive item of clothing that I bought was shoes. It seems as though Thom Mc An shoes sold for $3.60 a pair. The general manager of the shop had many duties and was responsible for everything that went on. One day after work there was a heavy rain. He asked me if I wanted a ride home. Of course I did. During the ride home he complained to me about how tough his job was and how little he was paid - $75.00 a week. I found no sympathy in my heart for him. He lived in a nice home, drove a late model car and made almost four times as much as me. I told the G. M. that if it were up to me he would be getting $100.00 a week. This was about three blocks from my home. He stopped the car and told me to get out. I could only think to myself, "What amount should I have said?"